As we get closer to that 1st game on Saturday, March 3rd at Scottsdale Stadium, you can feel the excitement all the way from SF. Baseball is almost here. Today is Day 16 of Camp here in Scottsdale, and the Giants Players are chomping at the bit to get going. Tomorrow will be a big day. Players will be arriving bright and early (7am) to take part in the annual PHOTO DAY, where several baseball card, AP photo, scoreboard and CSN Bay Area cameras will capture the players for the 2012 season. We will be covering that with some cool photos behind the scenes. Then a little bit later, the Giants will be hosting an intrasquad game. Giants vs Giants. We will be streaming the game live on SFGIANTS.COM beginning at 9am PST along with commentary from Marty Lurie and special Guests Brian Murphy and Paulie Mac from the KNBR Morning Show. 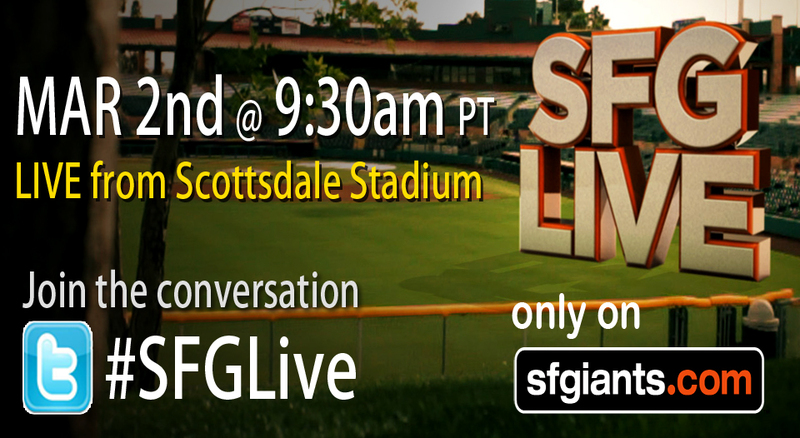 You can join in the conversation via Twitter #SFGLive – After tomorrow, we will be one step closer to Opening Day. See you in the AM! NEWS AND NOTES FROM DAY 9 – The Giants worked out from 10:00 a.m. to 1:15 p.m. today, the longest practice has gone thus far this spring. Players worked on fundamentals then took batting practice. WE’RE LIVE! 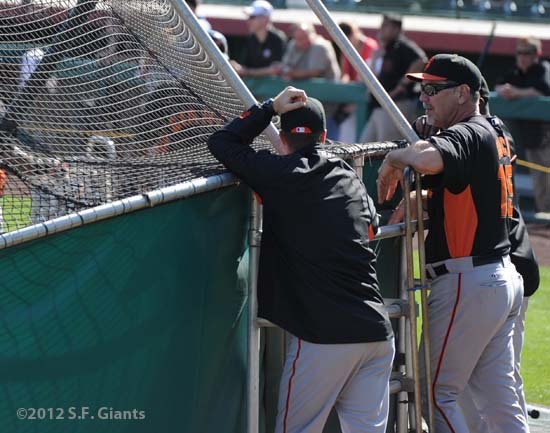 – For the first time this spring, Giants pitchers faced Giants batters in live batting practice. It was somewhat of a dangerous live bp as Hector Sanchez drilled Matt Cain in the leg with a line drive comebacker and Jeremy Affeldt hit Pablo Sandoval in the side with a fastball. Both Cain and Sandoval were okay. Buster Posey faced live pitching for the first time since his season ended last year. QUOTE OF THE DAY – “I don’t think I’ve ever been that excited to take live bp, ever!” Buster Posey on taking live batting practice for the first time today. SAY HEY! – Willie Mays made a brief appearance this morning, sitting in the Giants clubhouse and talking with players, coaches and staff. Mays usually comes in a few times a week and it’s fun watching all the rookies ooh and aah the Hall of Famer. PAT THE BAT – Former Giants outfielder Pat Burrell made a surprise visit this morning. He immediately walked onto the field as the players were practicing and gave Aubrey Huff a big hug. LIGHTS! CAMERA! – Comcast Sports Net Bay Area’s Amy Gutierrez arrived in camp today to do sit down interviews with Giants players and coaches. Comcast will use these interviews during the broadcasts throughout the regular season. The MLB Network was also in Giants camp today with Matt Vasgersian conducting interviews. 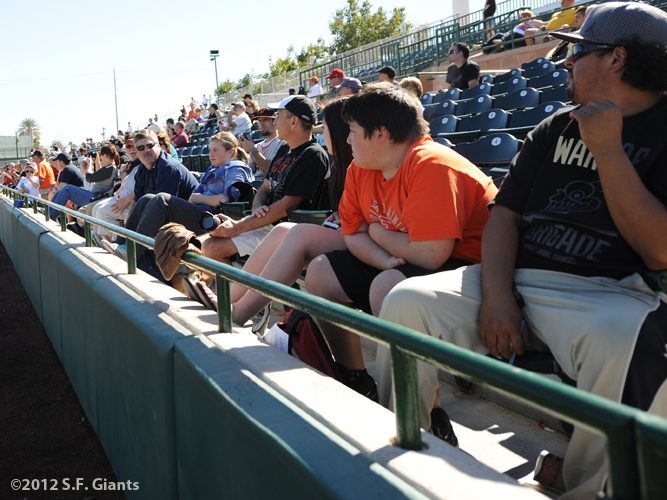 COMING UP – The Giants will have an intrasquad game on Thursday, March 1. NEWS AND NOTES FROM DAY 7 – Today was the first full squad workout with all 66 playersparticipating in camp. The day began with a 20 minute meeting in the clubhouse where manager Bruce Bochy addressed the team. BY THE NUMBERS – The Giants now have a total of 66 players in camp. The roster consists of 33 pitchers, 7 catchers, 16 infielders and 10 outfielders. QUOTE OF THE DAY – “It’s great to have everyone here. 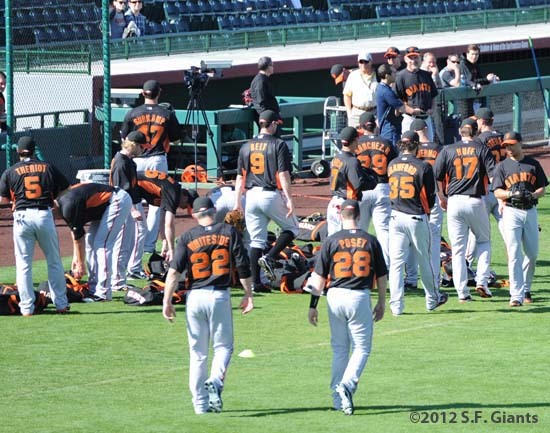 It was a great workout today” – Giants manager Bruce Bochy on today’s first full squad workout. CAMP VISITORS – Don Carson, the owner of Don and Charlie’s, which is a very well-known restaurant in Scottsdale, dropped by Giants camp today to watch the team practice. Don is very good friends with clubhouse manager Mike Murphy and tends to drop by several times throughout the course of the spring. Don and Charlie’s caters in the press box during home games. The restaurant is a famous spot for coaches, players, front office staff, scouts and all baseball enthusiasts. GOTCHA! – Giants first baseman Aubrey Huff played a little prank on Giants beat writers Andrew Baggarly (CSN Bay Area) and Chris Haft (MLB.com) by shooting them with silly string today. DID YOU KNOW? 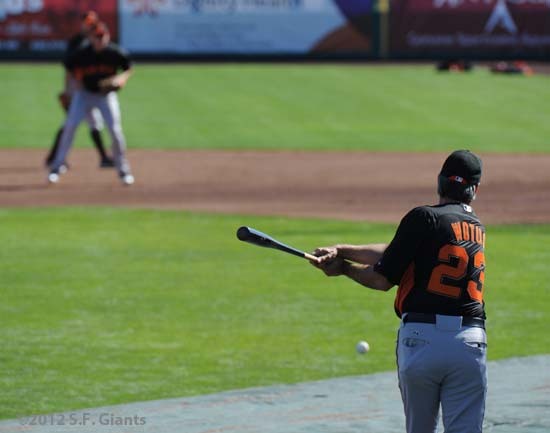 – Fans can watch the Giants practice over these next seven days before the games start. The gates at Scottsdale Stadium open up to the public at 10:00 a.m. every morning. Today there were approximately 250 fans in the stands enjoying the sun and watching the Giants players do drills and take batting practice. This is also a good time to try and get autographs. LIVE FROM SALTY’S – CSN Bay Area’s “Chronicle Live” show will be broadcasted live tonight from Salty Senorita’s restaurant in downtown Scottsdale from 5:00 p.m. – 6:00 p.m. PST (6:00 p.m. – 7:00 p.m. MST). 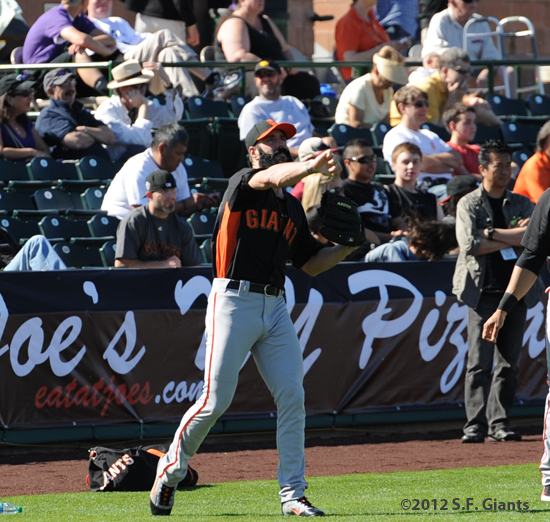 Brandon Belt and Brandon Crawford will be guests on the show. NEWS AND NOTES FROM DAY 6 –Brian Wilson completed his second bullpen session of camp and he seemed to throw a lot harder than he did on Monday. Tim Lincecum also threw for the first time since being scratched with back stiffness. Dan Runzler also looked good in his session. Giants pitching coach Dave Righetti was pleased with how all three pitchers’ bullpens went today. HI, MY NAME IS – New Giants outfielder Melky Cabrera made his first appearance at Giants camp today as this was the day that position players had to report. Minor league infielder Chris Dominguez also arrived today as well as outfielder Juan Perez. QUOTE OF THE DAY – “This is the best young catching talent that I’ve ever had in camp” – Giants manager Bruce Bochy on the Giants young catching corps. CAMP CELEBRITIES – Former Giants great Will Clark is currently in camp. Clark leaves tomorrow but will be back in late March for another week. J.T. Snow and Jeff Kent are due to arrive tomorrow. SMILE! – Giants team photographer Missy Mikulecky made her annual debut at camp today, taking pictures of players that the Giants Community Fund will use for their yearly Junior Giants pamphlet. Some of the pics that Missy had to get were of Jeremy Affeldt brushing his teeth, Javier Lopez applying sunscreen to his face and Nate Schierholtz eating vegetables. PLEASE SIGN HERE – Today was the last day for players to sign baseball’s, bats and jerseys for the Giants’ Community Relations department. Madison Bumgarner, Mike Fontenot, Conor Gillaspie, Aubrey Huff, Buster Posey and Ryan Theriot, all spent a lot of time this morning and afternoon signing dozens of items. GO WARRIORS! – Emmanuel Burriss and Brandon Crawford went to U.S. Airways Arena last night to witness the Warriors pull out a great win against the Suns. However, Burriss didn’t see the best quarter as he left in the third with the Warriors ahead by 20. So ever wonder what a players schedule is like during these first two weeks of spring training when there are no games? Below is what Giants starting pitcher Madison Bumgarner’s routine is during these first two weeks. 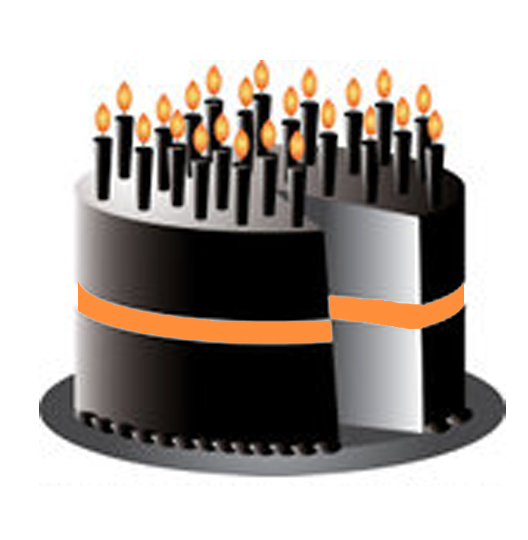 Can you guess who’s turning the big 8-0? Tempe, Ariz. – The Giants lost to the Indians tonight 7-1 at Scottsdale Stadium. Barry Zito started for the Giants and took the loss, throwing 6.0 innings with 5 strikeouts, while allowing 4 runs (2 earned) on 7 hits. Jeremy Affeldt threw 1.0 inning while allowing 1 hit and Dan Runzler pitched a perfect 9th, striking out 1. The Giants lone run came off a solo home run to left field from Miguel Tejada in the bottom of the 7th inning. Buster Posey finished the game going 1-for-2 with a single and a walk. Brandon Belt went 1-for-1 with a single. Tomorrow, the Giants travel to Surprise Stadium to take on the Royals. The Giants will send LHP Madison Bumgarner (1-3, 4.76) to the hill to face RHP Vin Mazzaro (0-1, 5.84). First pitch is scheduled for 6:05 p.m. and can be heard at sfgiants.com. Tempe, Ariz. – The Giants were blanked by the Angels 8-0 today at Tempe Diablo Stadium. Matt Cain threw 3.0 innings, but gave up 5 runs on 7 hits. Aubrey Huff finished the game 2-for-3 with a pair of singles and Buster Posey reached base in all three of his at-bats, going 2-for-2 with a pair of singles and a walk. SF relievers Ramon Ramirez, Santiago Casilla and Marc Kroon combined to throw 3.0-scoreless innings. Cody Ross left the game in the 1st inning with a strained right calf after running in to catch a line drive by Alberto Callaspo. Tomorrow, the Giants host the Cleveland Indians at Scottsdale Stadium. The Giants will send LHP Barry Zito (2-0, 2.30) to the hill to face LHP David Huff (1-1, 8.25) of the Indians. First pitch is scheduled for 7:05 p.m. The Orange and Black Attack is now on SF GiantScoop! Attack, I would like to say how happy we are to be a part of the SF GiantScoop! around the San Francisco Bay Area. Also, to learn more about the team, check out http://sanfrancisco.giants.mlb.com/sf/fan_forum/orange_black_attack.jsp to read quick bios and fun facts about each member. Scottsdale, Ariz. – Today’s game between the Giants and Rockies was canceled in the middle of the 3rd inning due to rain. Tomorrow is the Giants first off day of the spring, with play resuming Wednesday, March 23 as the Giants will travel to Tempe Diablo to face the Los Angeles Angels of Anaheim. RHP Matt Cain of the Giants (0-0, 0.00) will toe the rubber against RHP Ervin Santana (1-1, 3.65) of the Angels.